This is the first in a series of memories about visits to Louveciennes, the fabled village outside Paris where Anaïs Nin and her husband Hugh Guiler rented a home that became the site of many of Nin’s awakenings and the setting for the first of her published Diaries. Feb. 1992: Cathedral bells. Dimanche. Sunday in Paris. I opened the curtains and looked up at the steel gray clouds. No one in the street. It was like an empty stage. The sky looked ill-boding. I was planning on going to Louveciennes in the afternoon to find the mythical “laboratory of the soul,” the house where Anaïs Nin met Henry Miller, the place where her first real adventure in life and art began. It seemed like an impossible journey—first, I didn’t know anything about the French rail system, didn’t have a map, and didn’t even know if the house still stood. But somehow I felt hope as I opened the window and let the dank air flow in. I remembered reading in Anaïs’s diary that one took the train from Gare St-Lazare and that the trip took a half hour, but that was in 1931. Yes, this was a gamble in regards to the very little time I had left in Paris, and I knew I could’ve visited Versailles or Fountainbleau, etc., and that would’ve been worthwhile, but this, this could touch the soul. So I hoped the rain could wait. By the time I got to Gare St-Lazare, it was nearly noon and I was famished. I peered into the window of a bistro where I saw an old woman shoveling in some veal and pasta. I ordered the veau Milanese and washed it down with wine. Absolutely perfect. The combination of hunger, fatigue, and its remedy, along with the anticipation of the excursion, had awakened my sensory receptacles. I crossed Place Gabriel Péri, full and rested, and headed toward the huge train station. Inside this prodigious cavern was a menagerie of schedules, maps, people, confusion. As I stood gaping, a little man asked me if I needed help. I admitted my ineptness, and he guided me to a fire-engine red mechanical ticket dispenser. “Ou allez-vous?” he asked. “Louveciennes.” He pushed a button. “Allez-retour?” “Oui.” “Première ou deuxième classe?” “Deuxième.” “Voilà, monsieur. Onze francs.” I put the coins in the machine and it spit out the ticket. Two bucks round trip. So easy. I gave the man ten francs, which I thought he expected. Everyone was happy. Now, what train? I looked toward the quais, and there were more trains than I could count. I had no idea! Remember, I had come not only from the birthplace of the train, but also from its graveyard. But the man, who’d turned to leave, came running back and escorted me to the correct train, imploring me to hurry because it was about to leave. As I boarded, he was still there, smiling and waving at me. The signal sounded and the door closed. We began to inch out of the station. This was real. The train made the same stops it must have made whenever Anaïs or Henry took the trip to Louvciennes…St-Cloud, Bougival… After exactly a half hour, we pulled into the Louveciennes station, which was very old, quaint, beautifully clean. I noted on the schedule that a train left for Paris every half hour until late at night, so if things went poorly I could leave at any time. It was good to know that I had a safety valve, but, in a way, I would have preferred to be stuck there, having no choice but to make the best of it. I stood on the street. Deserted. Deafening silence. A gray Sunday afternoon in a little village. I looked at a large map of the village in front of the station. Nothing to help me. So, I decided to walk toward the city center and find someone who might know something, but I truly had no idea where I was going. I took a deep breath and started, heading west from the station. After a moment, I encountered an elderly couple walking toward the station, on what appeared to be a little Sunday promenade. Seizing the opportunity, I stopped them and asked, in the best French I could muster, if they knew where Anaïs’s house was. Neither one of them had ever heard of her. I was astonished. My heart sank. How was it possible they had never heard of such a famous resident? They bade me good luck and turned to leave. But then the gentleman said, “There is a book about the history of Louveciennes. I have some business at the train station. When I return, we’ll consult the author.” Suddenly my soul soared. I stood and chatted with his wife while he was gone, trying to explain why I’d made this pilgrimage. She had beautiful dark brown eyes and was bundled up on this cold, damp day. Explaining the life and work of Anaïs Nin to a louveciennois was, for me, the task of a disciple, but not a task at all, instead a unique pleasure. When her husband returned—tall, erect, nattily dressed with a sweater, shirt and tie under his overcoat and silver hair under his cap, clear blue eyes behind his spectacles—we walked to his neighbor’s house, the author of the book on Louveciennes. The couple introduced themselves as Henri and Thérèse. I felt something happening at this moment. It was Louveciennes opening her arms to receive me, as if she knew my intentions. I was here out of my love for what had been written, for the feelings that were aroused in me across an ocean of water and time. It was as though she respected those who came and treated them with kindness and gentleness. Henri suggested that we drive to Anaïs’s house. When he asked if I’d like to have something to drink first, I declined: I wanted to see the house before I awoke from this dream. Henri unlocked his garage and pulled out his car. He said, “Do you see? I have a Ford!” I’m not sure what impressed me the most—the fact he had an American car in this land of Renault and Peugeot, or how proud he seemed of it. He gushed about its power, pep, solidity, etc. Then I found out he had been in a German prison camp during World War II and was liberated by Eisenhower’s forces. No wonder he had a passion for all things American. The once stately house (map) had been reduced to a huge eyesore. The delicate latticework had crumbled and fallen to the ground, lying helplessly entangled in the weeds. The shutters, long closed, were rotting. The courtyard was overgrown, the gravel now buried beneath the mud and shaggy brown plant life. There was a construction company placard on the gate and signs of repair on the slate roof, and what little that had been done gave a hint of the potential grandeur of the place. I tried to imagine what it was like on the inside of this house that knew so much living, creation, love, and lust. Today, dark, dilapidated, and cold. Rain leaking into the bedrooms, wind whistling through the broken windows and blowing litter across the rotting floors. Each day the sun traveling its path, warming different sides of this lifeless place, streaking in through the cracks in the shutters and illuminating the emptiness and death within. In summer, the lightning electrifying the rooms for an instant, the thunder echoing as laughter once did. A temple of life now a tomb for ghosts. Craning my neck to peer over the huge locked gate, I could see the doorway where Henry Miller once posed for a picture. I stared up at the windows from which Anaïs watched her husband, Hugo, leave for work at a Paris bank, the gravel crunching under the tires of his car, the gate creaking and moaning a farewell, locking her inside. The honeysuckle whose fragrance Anaïs described was still there, its long, barren fingers reaching up to the second story windows. On the gate was a plaque which stated “Anaïs Nin (1903-1977), Romancière Américaine, vécut dans cette maison de 1931 à 1935.” Thérèse wondered aloud if we couldn’t get into the courtyard to look around and tried in vain to open the gate, which was under lock and chain. The vigor with which she did this astounded me—I thought she was going to knock the rusty gate off its hinges. Henri laughed and begged her to stop. So, instead, she took my picture standing next to it. From there, Henri and Thérèse took me on the grand tour of Louveciennes and its environs: the aqueduct built by Louis XIV to carry water from the Seine to the fountains of Versailles, the chateau of Madame du Barry, Renoir’s house, Marly-le-Roi, where nothing is left but the foundation of a royal chateau on which the traces of the rooms are still visible, but the crown jewel of our tour was, according to Henri, the American barracks, the American store, and the nightclub the American soldiers had visited. If not for his enthusiasm, this would have been a spot we would’ve passed without a second glance. But I could feel his emotion. It was touching to see his gratefulness, something he’d never lost. To be showing an American this place was very special for him, and a moving moment for me. Afterward, it was off to their house for tea and cookies—American cookies, to be sure—and a long, beautiful conversation. A friendship was being forged as the feeble sunlight faded, and my trip back to Paris was dreamlike. I was indeed taking a different piece of France home with me. “I had to wipe away the dust that covered my ‘Companions of Oblivion’ in order to show it to Godmother, who was very much interested. She promised to subscribe for 50 cents a month, and we agreed that after I read the monthly journal to Thorvald and Joaquín [Nin’s younger brothers], I am to send it to her, so that I don’t have to write the paper twice. I would spend the day writing happily and without getting tired, but Maman watches over my health and won’t let me do that, saying, “Don’t hurry so much, fifille, you have time. “Miss Mary Devlin, a friend of Maman’s, came over yesterday in the evening and I had to read her my latest poem, ‘Birth,’ and it seems to me she says it was very good. She told Maman that I could write for ‘Le Courrier des Etats Unis.’ Ah, if I could! My goodness! What a joy for me if I could make use of my chicken tracks and earn a little money for Maman! But alas, I haven’t much hope”(Linotte 139). The poem Nin refers to follows, from No. 10, the October 1916 issue, translated from the French. She seems to be depicting the idyllic family awaiting the birth of its newest member: the gentle mother, the worried father, the loving grandmother, the doting grandfather. And yet little Anaïs throws in a twist at the end…perhaps life is fragile even in a perfect world. And the old Grandmother exclaims, There is nothing but darkness! Life is waiting for someone! 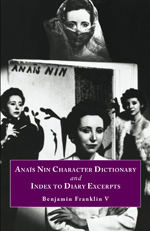 We hope you like the new format of our Anais Nin blog. If you have comments or suggestions (accolades are not frowned upon), please leave a comment. New postings are forthcoming.